Since the dawn of time, we’ve been fascinated by what we call “magic”: things that we can’t explain. There must be some sort of explanation, right? Enter The Illusionists. This mind-blowing spectacular showcases the jaw-dropping talents of seven of the most incredible illusionists on earth. The Illusionists has shattered box office records across the globe and dazzles audiences of all ages with a powerful mix of the most outrageous and astonishing acts ever to be seen on stage. Dan Sperry, or “The Anti-Conjuror,” as he’s known, is a Minnesota-native. He’s been described as Marilyn Manson meets David Copperfield. Sperry combines the art of magic with the macabre and is one of the top 10 most Googled people, thanks to a legendary America’s Got Talent appearance. Your stage persona is The Anti-Conjuror. What does that mean, where does it come from? Dan Sperry: I’ve been influenced by a lot of people and things… movies, stories, art, lots of things. I really love German Expressionism films and Quentin Tarantino films. Disney is a big source of inspiration, motivation, and just the constant desire for make believe. The word “Anti-Conjuror” is a title I created for when I would work night clubs and goth clubs; places like that where I would open for bands and DJs. I couldn’t have the title of “magician” or “illusionist” on the poster or flyer because I would get pre-judged before I even walked out on stage, so I started using the word Anti-Conjuror to represent what I do and sort of fly under the radar. Is your street persona anything like your stage persona? DS: Yes, I think so. It is all relative to the situation though. I can perform in front of 3,000 people, no problem. But sometimes being in a small group and having to socially interact with just three people… I don’t know, it can be intimidating at times. I would have to say though that the on-stage me is just a bit more exaggerated than the off-stage me, although I’m sure there are people that would argue that. How has your stint on America’s Got Talent propelled you? DS: America’s Got Talent was great because it introduced me to a whole new, much larger demographic. Before then I had a core group of fans in the 13-33 age range, but after AGT I was introduced to a wider demographic thanks to their viewership. So now people might not get as freaked out from looking at a poster or advert for me like they may have before. For example, I remember I was doing my tour a few months after the AGT thing went viral and there was this 70-year-old guy who was at my show for his birthday. His wife said that all he wanted for his birthday was to come to see a Dan Sperry show. Before AGT I don’t think that would have necessarily happened. What drew you to become an illusionist? DS: Getting to play make-believe for the rest of my life. Why are audiences drawn to illusion performances? DS: Getting to play make-believe, even as adults (which, unfortunately, many adults forget how to do). 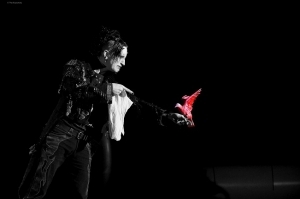 The Illusionists will appear at the Ordway Center for the Performing Arts through March 29. For more information and to purchase tickets, head to www.ordway.org.